Can’t stand the sticky feeling of body lotions or find the time to moisturize? Make every day a body lotion day! Doesn't work for my skin, but it's a great product. TI would recommend this product for everyone that hates applying body lotion after bath and feel all oily and creamy after that... It makes your skin soft without the need to apply anything after bath. Beware that it helps dryness but it is not that effective as a body lotion, so probably I would recommend it to people with not so dry skin. I ordered it from here cause it had a really good price here. Iove this product. My skin fee is instantly moisturized. I also use it to remove my makeup, then rinse it off.works really well for this also with no stinging in my eyes. This is my first time using a product such as this. I do have mixed feelings about the extra application time in the shower, but it's still much less time than if I'd have to apply another product after showering. Which is why I tend to apply it only when I'm staying home. The smell is quite subtle. Not sure that I love this product....I was very hopeful, but I don't think it compares to cream used after the shower. I am short on time (with a newborn)-so it is great from a convenience perspective. I have very sensitive and dry skin so I plan to keep using and see if it makes a difference over a bit of time. so happy they came out with this product, b/c when Olay discontinued theirs i was so upset... it's so much more convenient to be able to moisturize in the shower. this one is probably best for winter b/c it's thicker than the others, but i need it. the white bottle is a lighter consistency and better for the rest of the year, i think. 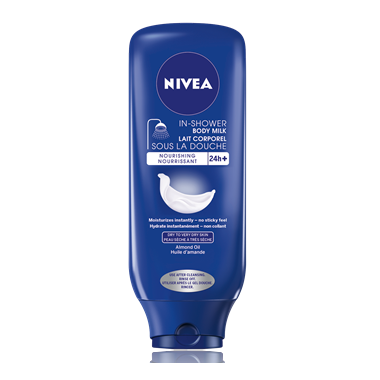 and of course, nivea products always smell so light & fresh! Great product. works really good! Love this product. I have been looking for a product like this since Olay dicontiued theirs. This product is even better. Will continue using it and recommend it to others.